My photograph made with Edwin Smith’s Autorange camera on 6×9 roll film. I had with me Edwin Smith’s Ensign Autorange camera, given to me by Olive Cook in the 1990s, as I believed this may have been the camera Smith used for the original photograph. As it turned out, the Smith picture must have been made with his Graflex on sheet film, with a wide-angle lens. It was not possible with the Autorange to get the field of view required to match the original from the only position where the photograph could have been made. 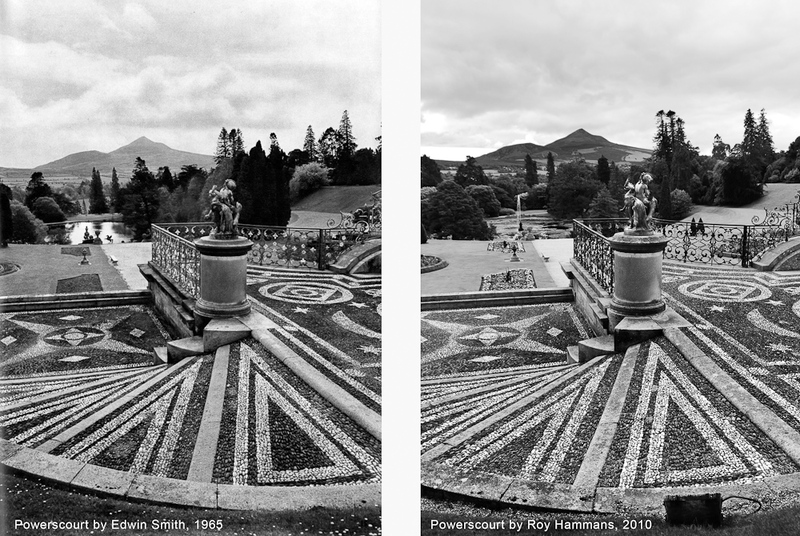 After looking at the copy of the original held by RIBA (home of the Edwin Smith Archive) on my return, it is clear from the format of that that the negative was not the 2:3 ratio of the Autorange (although the picture was cropped to that format for the book). The image I made, on Tri-X 120 film, is shown on the left. The angle of view with the 105mm Ross Xpres lens on 6x9cm is approximately 47 degrees on the vertical. An actual attempt to replicate the original was made with a 28mm lens on my Nikon D700 (vertical angle of view ~65.5 degrees). This is roughly equivalent to a 90mm lens on 5×4 film (vertical angle of view ~ 70 degrees). There is now a large conical clipped yew occupying the point from which he must have taken the original photograph, but it was possible – by ignoring the ‘Keep of the Grass’ signs – to get fairly close. Edwin’s view (left) next to my digital rendering. 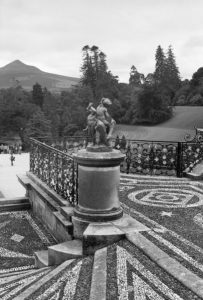 The resulting digital image was processed in Adobe Lightroom, converted to black and white and cropped to match the original book image as closely as possible. Thanks must go to my trusty assistant for guiding me to the correct spot with iPad-driven instructions as I trespassed onto the forbidden areas of the lawn in front of the yew bush! You can see the degree of success I achieved in the pair of images shown; one shows the original by Smith as featured in the book and the other is my digital version, made 45 years later (click to enlarge). Smith was perhaps very slightly further to the left in order to frame the view with his camera, but the difference is marginal. Fortunately, the weather conditions and season were very similar, although there is more atmospheric haze in his photograph. Other than that, it is remarkable how little has changed. Even some of the trees in Smith’s view look similar today, 45 years on. 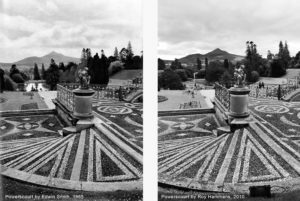 ‘Re-photographic‘ projects – attempts to recreate photographs from the same viewpoints as classic originals – are quite common; David Hurn famously followed Atget’s footsteps at Versailles and in the US the Rephotography Project by Mark Klett and others is another example. 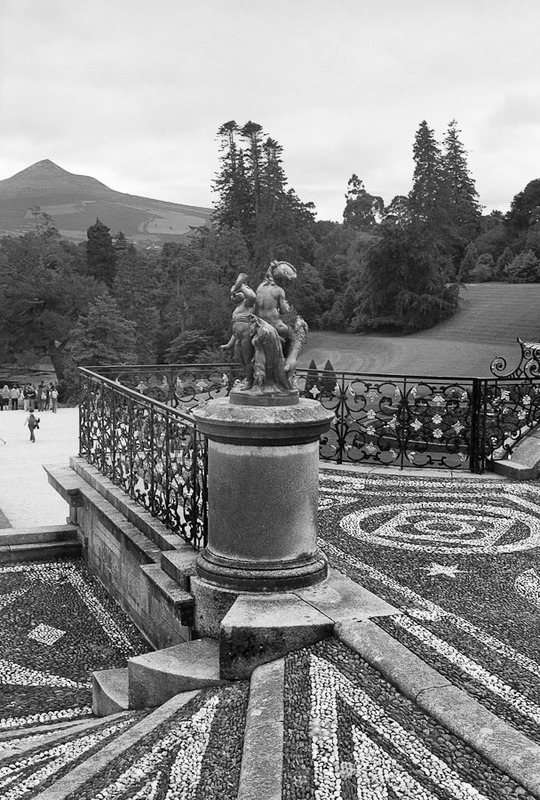 It has long been my desire to do the same with Edwin Smith’s classic images, this is the first I attempted. I was determined to follow this up with some further ‘re-visits’.